After really not enjoying this entire mini-series so far, I have made it to the end. And I’m really happy to say that I surprisingly enjoyed this final issue. This is nowhere near a favorite series of mine and not one I would recommend, but I think they wrapped this mini-series up in a really satisfying way. I have not enjoyed the storytelling and dialogue written in the issues leading up to this final issue and I didn’t necessarily fall in love with it in this one. The story as a whole was not one that I thought was that interesting or creative or funny. But this issue had enough heartwarming wrap up moments that it actually kept me interested while reading it. It may have been predictable but it definitely works well enough to close this chapter of Nick Wilson for now. I also enjoyed the dialogue in this issue despite hating it in the first four issues. It was a lot more natural but it did still kind of feel like dialogue from a soap opera. Nonetheless, I felt the emotions in the words that were spoken to Nick by Jane at the river and the start of the love connection between Nick and Coco. I still don’t think any of the writing is that clever or humorous despite the blurbs from comedians and other celebrities they keep printing on the back of these issues. The artwork has not really appealed to me in this series and this issue is really no different there. But this issue made me see how the art style does work for the story being told in this series. I have been really hard on the first four issues of this series because I did not really enjoy any of them but this fifth issue was the ending I think that this series needed. I was finally engaged the whole time reading it unlike I was with the others. The mini-series is wrapped up neatly with this kind of cheesy but entertaining final issue. I still wouldn’t let all of those quotes from comedians on the back of the issue lead you on in any way because it is not that clever or funny of a series at all. 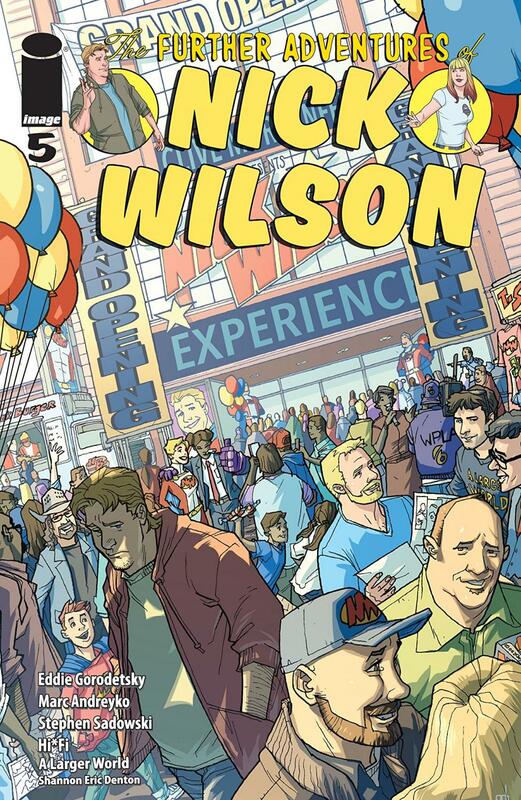 But if you have stuck with Nick Wilson this far, I think that this issue will be very satisfying.